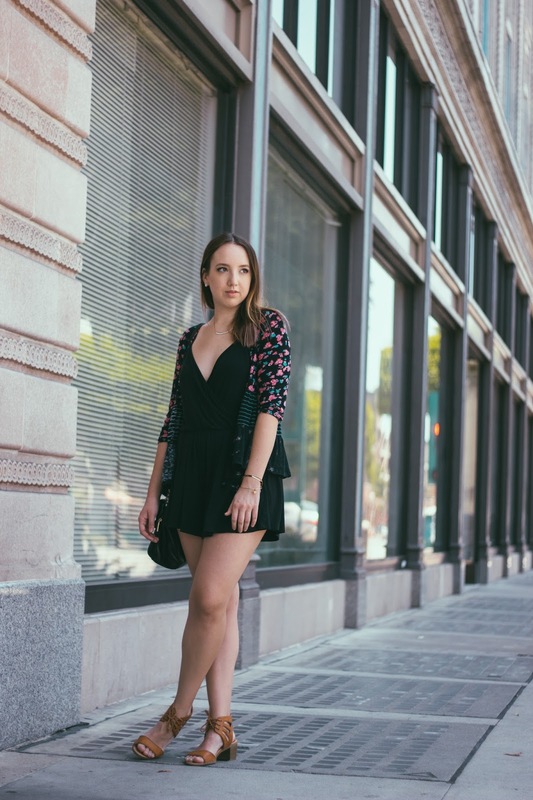 The black romper. This is something so versatile it exponentially grows the size of your closet with just one item of clothing. 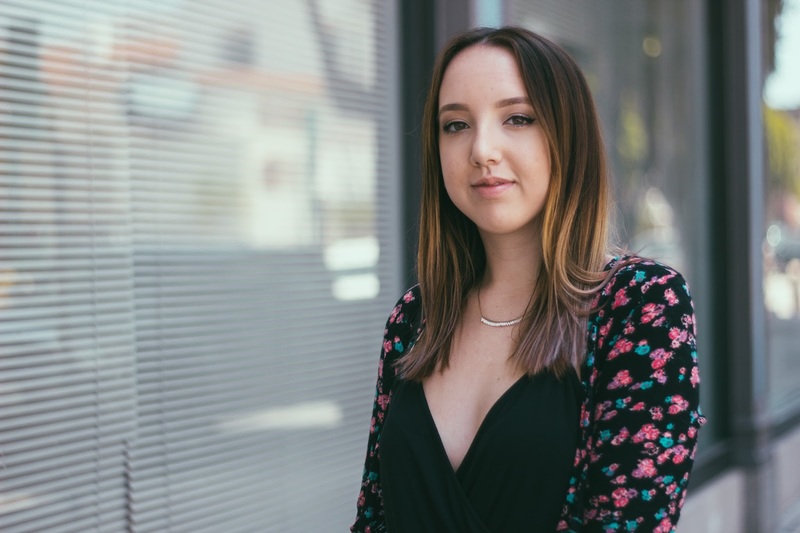 I have already worn this little Topshop number under a sweater for a casual-cool airport look, with a kimono and heels for a more dressy nighttime look, and here with a floral cardigan and sandals for some walking around in downtown. The cotton material allows it to be dressed up or down depending on your accessories, and the pleating around the waistline makes it even more flattering around my not so flattering areas. What is not to love here? For this look, I paired the romper with an Urban Outfitters floral cardigan and these cognac heeled sandals from Irene's Story. Jewelry was kept minimal, as always, wearing a dainty necklace and my favorite Alex & Ani bangles. 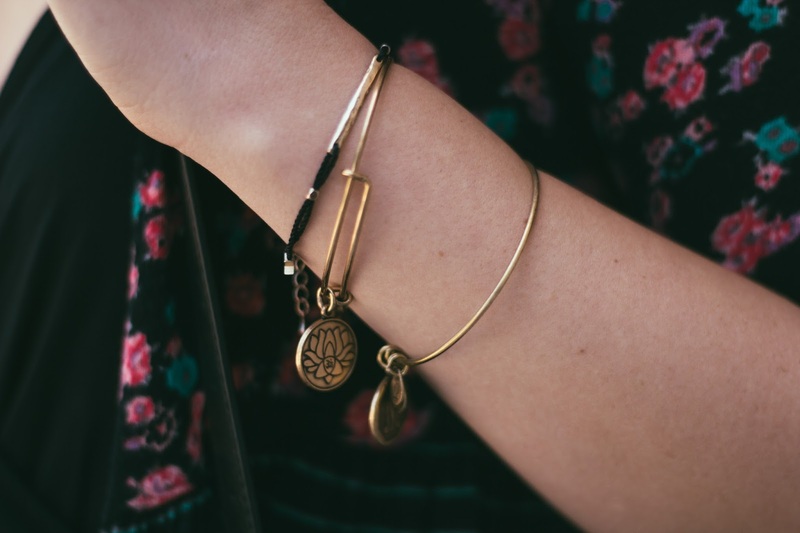 Of course, I have the lotus flower bangle. If you didn't notice already, I had a failed attempt at dying my ombre lavender. Have no fear, I am still determined to obtain this look. Stay tuned for an update. Special thanks to my insanely talented friend Nicole Busch for these photos! Please check out her website linked here. Oh, boy. In this look, I was wearing boyfriend jeans while simultaneously wearing my favorite Chanel Rouge Coco Shine in the shade Boy. See what I did there? My last few posts have really made me realize how basic my style is. When I mean basic, I mean a style made up of extremely wearable pieces. I do love a statement item, but I think you get so much more out of your wardrobe if you invest in items you can wear with so many different looks. Specifically for this outfit, I wore my new Topshop "Boyfriend" Jeans with a Nasty Gal blush tank top. I have always underestimated the importance of a good basic tee, especially in a wearable color like blush. It is so easy to style and instantly adds a casual-cool feel to an outfit. To balance out the not-so-figure-flattering ensemble on top, I paired the look with a more delicate shoe. These Steve Madden sandals with the stacked heel follow one of my favorite trends for the summer. Let's all thank Isabel Marant for introducing us to the "Carol" sandal last summer, which I think has inspired a lot of the shoes I've seen in stores this season. The look was topped with minimal jewelry and minimal make-up, strictly including glowing skin and supple lips. Hope you guys enjoyed this one! I especially loved the way these photos turned out. Thanks for reading. 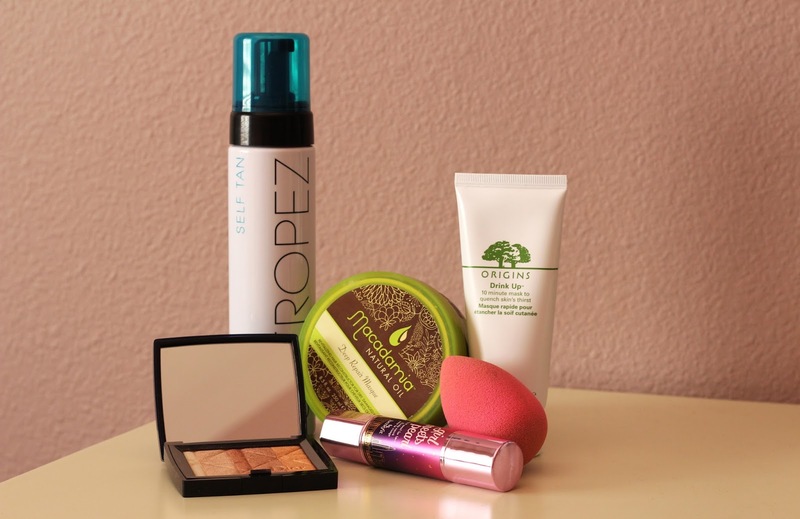 Short and sweet, I am going to do a run down of my beauty product picks for the summer. Fake tan, highlighter, and lots of moisture, it's definitely summer time. These are all products I love year round, but I find are especially good for use in the warmer months. Being a pale person, it is extremely difficult to obtain a summer tan without getting the fateful lobster look. Not to mention, it's not even a question about how important it is to protect your skin in the sun these days. I am an avid sunscreen wearer and I like to obtain my tan overnight in my bed…while my fake tan develops. I have tried so many self tanners over the years and this is the best one I have come across thus far. The mousse texture easily blends and the slight green color prevents any resemblance of an Oompa Loompa. I got through high school watching every girl show up the day before a school dance orange; I am way too familiar with that look not to know better. I find my skin gets a little dehydrated during the summer due to my exposure to the sun. I like to replenish my skin at night, and this is the perfect product to do so. It has a nice smell and nourishes skin that has been dried out in the sun. Origins also does a intensive overnight mask, which I have also tried. Truth be told, both masks feel and smell the same. Just like my skin, I like to keep my hair nourished in the summer as well. This is my all time favorite hair mask; again, a product I love year round but especially love in the summer. The stuff just smells so good and it really does put the moisture back into your hair. Because my hair is extremely thin, I get away with doing this about once a week strictly on my ends. Depending on your hair type, this stuff could potentially cause build up in your hair. It is pretty pricey as well, which is even more of a reason to keep it as that special treatment product for when your hair is feeling a little dry and brittle. Highlighter is a product I always break out in the summer. 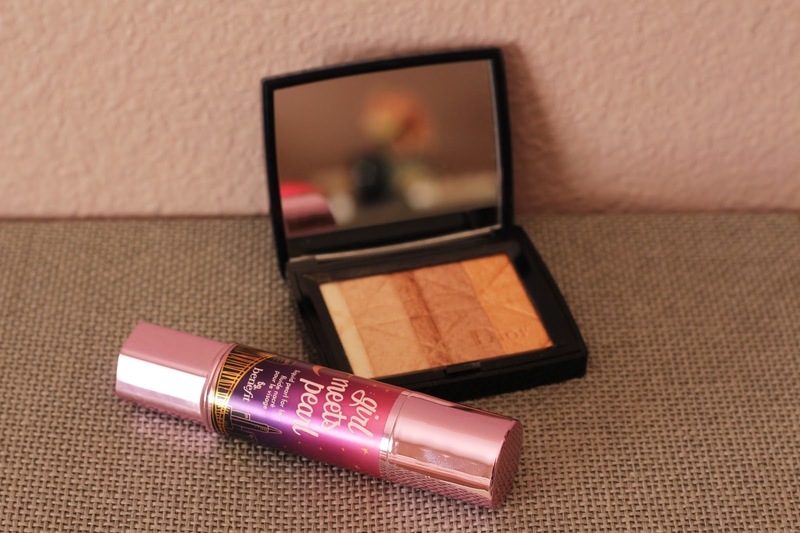 I think everyones goal is to have that dewy, sun kissed glow and this product does just that. The strip of colors range from all shades of gold and when swirled together and applied, you end up with the most perfect golden glow on the skin. Not only is this my favorite highlighter, but you can just as easily blend the colors on your eyes for some shimmer on the lid or tear duct. This is another product that helps you obtain that dewy glow, however, I find this highlighter to be much more subtle and natural. Perhaps it's because it is a liquid highlighter, but when blended into your skin you will get this subtle cool glow that reflects when the light hits it a certain way. It will not be obvious that you are wearing highlighter, but it will definitely make someone impressed with the appearance of your skin. I prefer to put this on top of my powder to tone down the matte look and bring some life back into my skin. The Beauty Blender is one of my favorite ways to apply liquid foundation. It takes more time, but I find it blends everything into the skin so well it looks airbrushed. Because it works better being damp, it provides an instant cooling sensation on the skin. It makes anything you put on look flawless, but still natural. If you are in a hot climate, the Beauty Blender provides the perfect make-up application while also giving off a cooling sensation at the same time. What's not to love here? 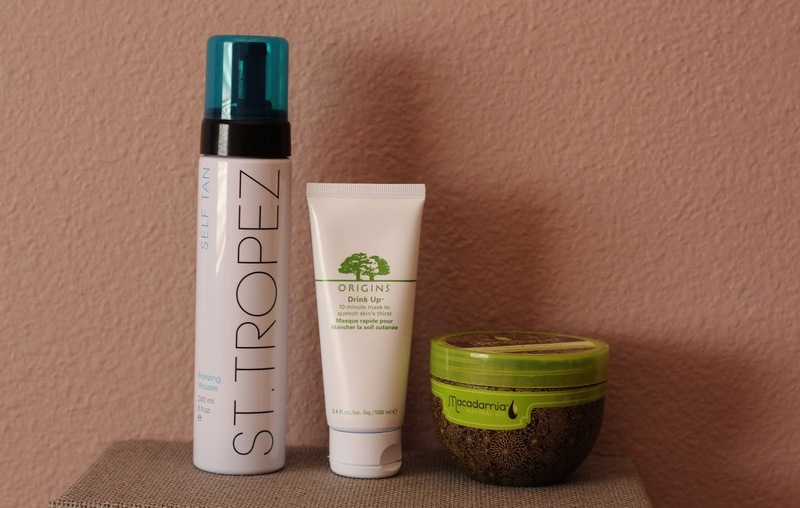 Well there you have it, my top beauty product picks for the summer. Hope you enjoyed! I give you two thumbs up if you made it to the end. Even my mom looks, but never reads.